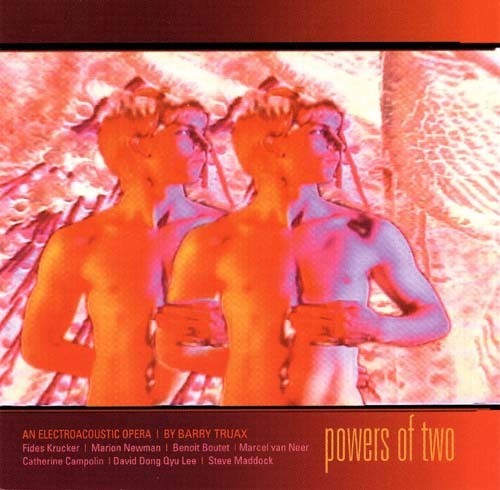 Powers of Two, Barry Truax's third electroacoustic opera, and by far his most powerful, sophisticated, and developed ... promises to be a revolutionary media performance truly deserving of the term twenty-first century art. - Randy Raine-Reusch, Musicworks, 90, Fall 2004, p. 52. Powers of Two is a project of epic proportions, with intricate layers of ancient, classical, and contemporary musical and cultural reference. - Kristiana Clements, Musicworks, 91, Spring 2005, pp. 51-52. Powers of Two ... examines the influence of technologically created and reproduced beauty. Acts Two and Three of this two hour work are particularly captivating. Mezzo Fides Krucker and countertenor David Dong Qyu Lee give superb performances. Kudos to Truax for creating a thoroughly contemporary plot and pioneering a new generation of opera. - Stephanie Moore, Musicworks, 94, Spring 2006, p. 61.